Your client imports the changes that you’ve made in the accountant’s copy of the QuickBooks 2013 data file into her working copy of the data file. In order to do this, the client chooses the File→Accountant’s Copy→Client Activities→Import Accountant’s Changes command. 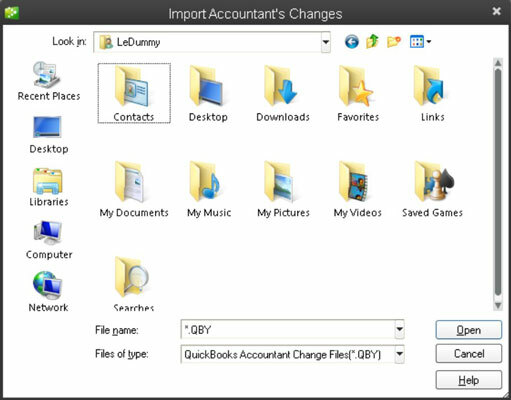 QuickBooks displays the Import Accountant’s Changes dialog box. To use the Import Accountant’s Changes dialog box, the client uses the Look In drop-down list to identify the location of the changes file. After the client identifies the location — this may be the disc with the changes file on it — the client should be able to see the changes file in the middle of the Import Accountant’s Changes dialog box. The client can double-click the changes file in order to import the changes into his or her QuickBooks data file. QuickBooks, by the way, displays a window that highlihghts the one shown to highlight the accountant’s changes to the file for the client. QuickBooks prompts the client to back up the QuickBooks data file. After the client imports the changes, QuickBooks removes the parenthetical phrase (Accountant’s Copy Exists) from the QuickBooks program window title bar.